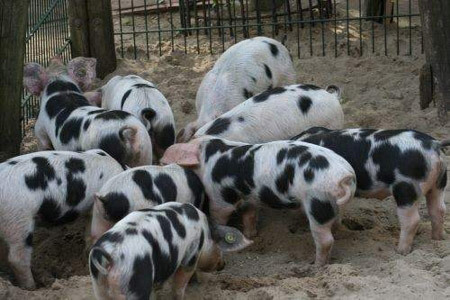 Originating in the Grafschaft Bentheim area of northern Germany, the Bentheim Black Pied Pig is also known as the Bunts Bentheimer Schwein, which is a mid-sized breed that is lop-eared with white with black spots with grey rings. Their best traits are that they are hardy and long-lived, with high fertility rates. They have an average of 9.2 pigs per litter. Boars average 75 cm height and 250 kg weight and sows average 70 cm height, 180 kg weight. In Bentheim Germany, in the beginning of the 20th century, the pig breeds consisted of a large number of colored swine. That are crosses of Berkshire and Cornwall breeds. The Bentheim became nearly extinct in the 1950s and is now considered a rare breed with only 100 registered breeding animals to date.